Your very first home, is the best investment you will ever make. This amazing value First Home Buyer Package, has everything for the young family. 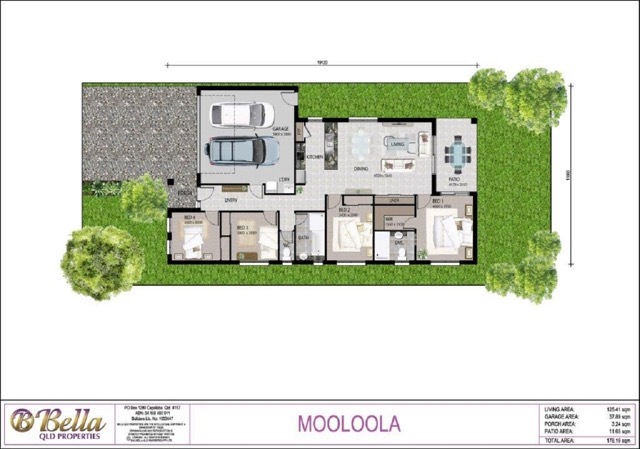 This Turnkey Package of the Mooloola by Bella Qld Properties at Ecco, Ripley, is the perfect start for the first home buyer. An ideal design offering 4 bedrooms, 2 bathrooms, 2 car garage, spacious open living area and a large outdoor area, which is perfect for that Sunday barbeque. Just 13 minutes by train to Ipswich from Walloon Station, Waterlea brings authentic countryside living to those who want to come home to somewhere truly special, every day. Hop on the Warrego Highway and youâ€™ll find yourself in Brisbane in just 45 minutes. Or head south and youâ€™ve got all the spoils of the Gold Coast for a day trip to some of the best beaches in the world. Closer to home, the charming town of Walloon has a fantastic state school, a convenient selection of shops and local eateries to feed your soul and Amberley RAAF Airbase, a major employment node is a short 10 minute drive away. Being so close to Ipswich has great advantages for those who work there, as well as major shopping, recreation and entertainment just minutes away by car. At Waterlea your newly built home will also be connected to the nbnâ„¢ network Australiaâ€™s broadband network. The nbnâ„¢ will provide both your internet and landline services with the fastest and most reliable broadband for years to come. Contact Brenden Bonning from Bella Qld Properties for more detailed information on 0433 772 747 or visit our display home at Sunset Place, Springfield Lakes.